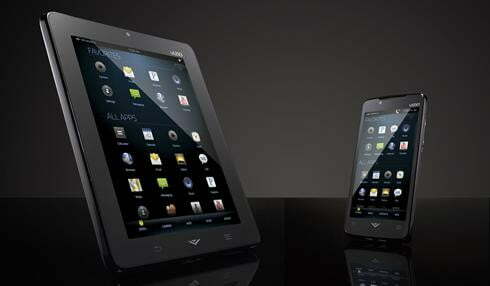 Vizio has announced plans to launch both a tablet computer and a smartphone sometime in 2011. Vizio, best known as a maker of affordable high-definition TVs, will unveil the Via Tablet and the Via Phone during the Consumer Electronics Show (CES), scheduled to get underway later this week in Las Vegas. The Via Phone will feature a 4-inch high resolution touch-screen and two cameras, one front-facing for video calling and another 5-megapixel camera on the phone’s back for photos and video. The smartphone will be powered by a 1-GHz processor and allow for Wi-Fi and Bluetooth connectivity. There’s also a HDMI connection for video playback as well as a MicroSD card slot for memory expansion. The Via tablet will offer an 8-inch touch-screen and a three-speaker design for stereo playback in either portrait or landscape mode. Vizio’s tablet will also be powered by a 1-GHz processor and feature two cameras, Wi-Fi and Bluetooth connectivity, a HDMI connection as well as a MicroSD card slot. Both devices will run on Google’s Android operating system and will also feature Vizio’s Via Plus Ecosystem for a unified user interface across devices, including Vizio TVs and Blu-ray players. Both will also feature a built-in universal remote app. We’ll have to wait and see if the Via Phone and Via Tablet adhere to Vizio’s tradition of affordable pricing.